Gail Gibbons gives a history of Valentine's Day--how it is celebrated, and why it is a special day for love and friendship. Full color. 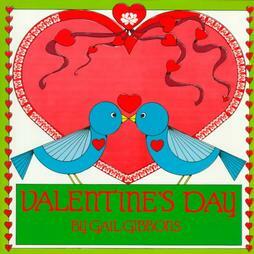 PreSchool-Grade 2 Gibbons continues her journey through the calendar year with Valentine's Day . The clear, colorful ink drawings are surrounded by frames decorated with small red hearts and bluebirds, while a short, simply written text describes Valentine's Day customs and historical origins. Several illustrations depict people in the dress of ancient Rome, but most show modern children and adults observing Valentine's Day by sending cards, giving gifts and having parties. Gibbons concludes with instructions for making a Valentine card and a Valentine box. Joyce K. Kessel's Valentine's Day (Carolrhoda, 1981) gives more historical information and is preferable for slightly older children, but this one fulfills the need for a short easy introduction which can be read to young children. The book is similar in style and format to Christmas Time (Holiday, 1982) but is less informative. The crafts can easily be found elsewhere. Not Gibbons' best, but, like her other holiday books, it will be popular.